Joining the $30 Nyko Wiimote charging stand, this $24 Thrustmaster T-Charge NW gies you space enough to charge one controller and even comes with a silicone Wiimote protector. The protector is pretty useless unless you're one of those people who engage in extracurricular activities your wife, but the charger itself is fairly decent. 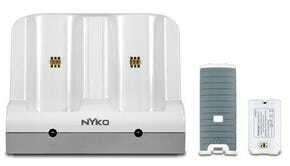 For $34.99, you can get a combo set with a charger, a stand, and a couple silicone protectors, but since that only comes with one charging station, we still prefer the two-station version from Nyko more.